Above: simplified graphic showing replication of the Foot and Mouth disease virus. Image measures 500 pixels across, original image is 3264 pixels across. 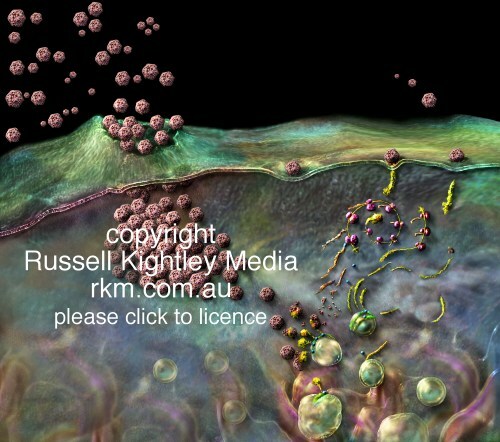 EXPLANATION OF PICTURE At upper right, incoming virus particles dock with the cell membrane using receptor molecules. The genetic material (yellow viral RNA) of the virus is then introduced into the cell. The viral RNA associates with ribosomes (the purple "beads" on the viral polysome) to produce viral proteins. Some of these viral proteins act as enzymes, while others are used to make new viral capsids (the outer protein coats of the virus). Viral RNA also travels to the smooth endoplasmic reticulum where it forms replication complexes. Such replication complexes are associated with new vesicles that form from the smooth endoplasmic reticulum. Here, new viral RNA is produced. Some will associate with ribosomes (to make more viral protein) and some will form the genomes of new virus particles (capsid assembly). The new virus particles collect together in large arrays (aggregation of new virus). Eventually, the cell is destroyed (cell lysis) causing a release of new virus particles. For a more detailed description at the molecular level, please check out the links above. Foot and Mouth Disease is a major problem affecting many animals of agricultural importance. It is caused by several strains of virus that belong to the genus Aphthovirus. Along with other viruses, like Polio and Rhinovirus, Aphthoviruses belong to the family Picornaviridae. Picornaviruses are tiny viruses (27-30 nm across). They are non-enveloped with an icosahedral capsid and contain a single strand of positive sense RNA. With many thanks to Ed Rybicki for his help and advice. Visit his introduction to molecular virology and see the section on RNA plant and animal virus replication and his page on virus entry into animal cells . The European Commission for the Control of Foot-and-Mouth Disease. BIOME: The Hub for Internet Resources in the Health and Life Sciences. Their VETGATE section has information on Foot and Mouth and their BIORESEARCH section covers virology and molecular biology.